Self care is talked about a lot these days, and for some of us our animal friends are a primary part of our self care routine. Our dogs Oliver and Moon Moon are such and important part of my day. Having connection time where we cuddle is important to all of us. If I have been out all day, they are the first ones to greet me tails wagging! It brings me so much joy. But lately I’ve noticed that our connection time primary consists of dog walks and cuddling on the couch watching television. That may feel good for me, but is that fulfilling for them? I’m not exactly present with them when I am watching television! A lot of articles I found talked about how animals are a great way to slow down, care for ourselves, and help us be in the moment, but what about their needs? We are often so focused on our needs, it is easy to forget to check in with your animal companions needs. So in the interest of self care for us all, I offer these 5 activities of self care that can benefit you, your animal companions, and your connection. Intentional time connecting: Turn off the television, the podcast, or anything else distracting you and spend 10-15 minutes just petting and connecting with your animal companion. Slow your breathing and breath together just letting the energy between you strengthen. Offer your animal friend a clearing: Do a simple clearing for both of you! Before you start crack a window or light a candle. Ground yourself or take some deep grounding breaths. Invite your animal friend to ground with you. This is especially great if they are over active, hyper, insecure, or anxious. Once you are grounded and you are both relaxed, pet them the same way you usually do, but imagine your hands collecting any energy that they no longer need. You don’t need to know what it is. You can just call for anything they are ready to release. When you have reached the end of their body, send the energy into the candle or out the window. This way none of the energy stay’s on you or in your house. Continue to “brush” them this way until you or your animal friend "feel’s done". This might look like them getting up and leaving, you having a sense that the work is finished, or them waking up and looking you in the eyes. Trust yourself! You will know when you are all done. To finish up, reconnect to your own grounding and center and invite anything you are ready to release to rise up in you. Take a few deep breaths. Gather all they energy you are ready to release and exhale towards the window or the candle (which will blow it out). Take as many cleansing breaths as you need. Close up the window / blow out the candle and go wash your hands or take a shower. This is a great practice to have to help you both release anything that isn’t needed anymore and can be done as often as needed. Communicating while you’re at work/away from home: Stuck at work and needing some animal time? Call your animal companion! Using Animal Communication you can talk to them anytime, and I’m sure they would love to hear from you. Take a moment and close your eyes. Think of your animal friend’s face in your minds eye. If this doesn’t work for you, you can look at their picture or think of how you feel when you are with them. Call them closer to you and really connect with how you feel around them. It’s ok if you aren’t sure or feel silly - just allow yourself to play! So now you’ve got them on the line, and you can just talk to them like you do when they are in front of you. Or I like to leave my pup’s “voicemails” : “Hey Moon Moon! Hey Oliver! What are you all doing? Sleeping? That’s cool. I wish I was sleeping with you, but I’m at boring work. I really miss you both. I’m super excited about our walk when I get home! Then we can snuggle up and I can read you that new book I got about animal feelings! Sound good? Cool! See you later! Don’t eat the trash please! Ok! Bye!” Or whatever else you want to say. Say it out loud or to yourself. Either way they’d love to hear from you. And they just might “call” you back tomorrow when they get bored and want to hear your voice! Massages for everyone! Spend some time giving your animal friend a nice gentle massage. Get cosy and relaxed together and explore what makes them take those deep breaths. I like to massage Oliver’s shoulder and hips gently as he enters his golden years, but lately I’ve noticed he loves when I just gentle rock him! He lays on the bed and using the lightest touch, I move his body in a rocking rhythm. Once we get a good rhythm he just zones out completely. Experiment! See what they like! And if you have a cat friend, they might even return the favor. Play! Spending time together playing is such a great way to connect and unwind. Playing helps us center joy, laughter, and being in the moment. It’s fun for your animal friends, a great way to connect with each other, and can give you a chance to let some fun kid energy run wild! 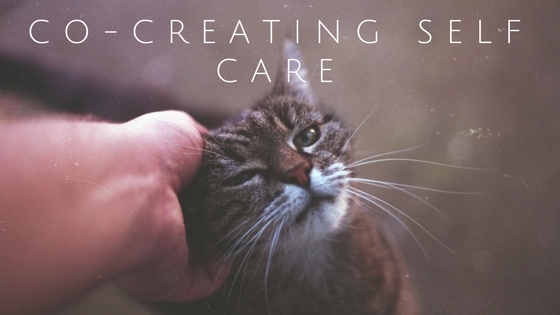 I hope these ideas spark new ways to co-create a self care routine with your animal friends, and I’d love to hear the ways you and your animals nurture each other.